This offer is open to all that will be able to repay back in due time. If so, you can validate your approach directly against a known plaintext. They're fairly simple and quick to run, but will crack a lot of very weak passwords. The views expressed in this post are the opinions of the Infosec Island member that posted this content. And dont forget to check out the companion site for future updates and versions. So the greater challenge for a hacker is to first get the hash that is to be cracked. This works for both interrupted and running sessions. Please remember to use these techniques only for legitimate educational and testing purposes and not maliciously. Dictionary Attack Uses a provided wordlist and optionally some permutations. 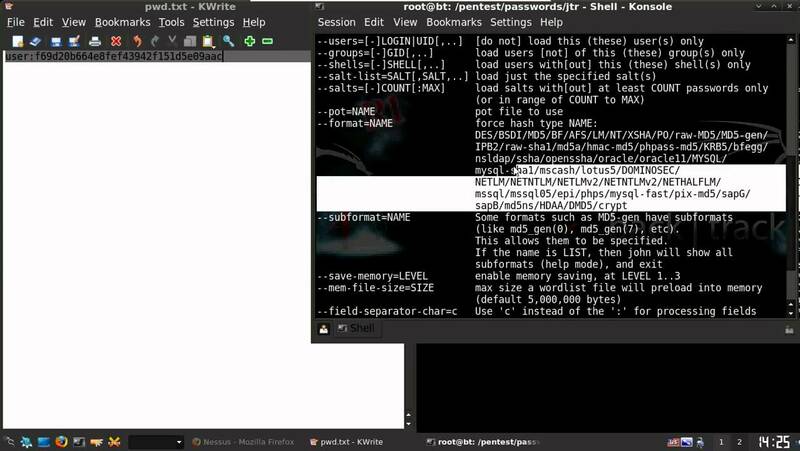 Fortunately, the Metasploit Framework has already provided us with a module to do this : 1. John the Ripper is a registered project with and it is listed at. The rest we will have to use brute-force. It is one of the most popular password testing and breaking programs as it combines a number of password crackers into one package, autodetects password hash types, and includes a customizable cracker. In this type of attack, the program goes through all the possible plain texts, hashing each one and then comparing it to the input hash. Today I will show you how to crack windows password hashes. One of the modes John the Ripper can use is the dictionary attack. So we can now use john —show option to list cracked passwords. Unless I've misunderstood that suggestion? 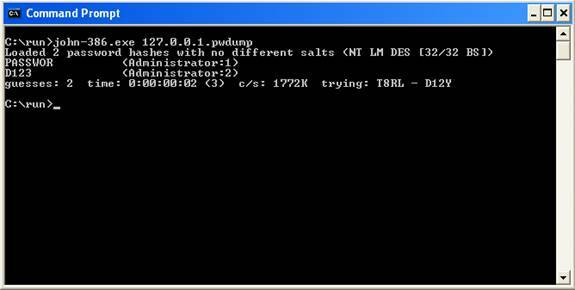 Want to get started with password cracking and not sure where to begin? There are by John the Ripper user community members for , , , and. Also for some password cracking swag head on over to to check out the latest. John the Ripper is different from tools like Hydra. In some cases it is faster to use some other pre-defined incremental mode parameters and only crack simpler passwords, from a limited character set. To use these rainbow tables the tool will need to be downloaded. A small dictionary with a good set of rules will crack a huge number of passwords, so it really comes down to the quality of the rules you have. I thought it might be helpful to compile a cheat sheet to reduce the amount of time I spend grepping and googling. John uses character frequency tables to try plaintexts containing more frequently used characters first. It tries this password on all hashes in your file so the more usernames you give it, the greater chance of it finding something in the single crack mode. Especially given the passwords that have been cracked! This just goes to show how weak passwords can be, and how easily they can be cracked with the right tools, network access and knowhow. In this post, I will demonstrate that. My name is Renee Joan Rothell, and am from Ridley Park, Pennsylvania. Does the password length make any difference at all? All you need to do is specify a wordlist a text file containing one word per line and some password files. But does it save us any time? Instead they store hashes of passwords and when authentication takes place, the password is hashes and if the hashes match authentication is successful. Most wordlists that you may find on the Net are already sorted anyway. Note: For a list of dictionary files see my. I know that disk space is relatively cheap now, but five years ago this was a much bigger deal. A brute force attack is where the program will cycle through every possible character combination until it has found a match. You recover a fair amount of the passwords but fail to make any real breakthroughs. The project is also pretty much abandoned, so it's unlikely there will any new features added in the future. However, you can modify the config file to alter the way the mangling is done. I won't go into Rainbow Tables in detail here, but essentially they allow precomputation of password hashes to greatly speed up the cracking process. See for detailed description of each mode. This is not always a good idea, though, since lots of people do not check their e-mail or ignore such messages, and the messages can be a hint for crackers. The more experienced users and software developers may , along with revision history information for each source file. Next, one would wonder about just using Kerberos authentication. The primary one being disk space. If you post more about that I can try to assist more. It can also perform a variety of alterations to the dictionary words and try these. Strengths The biggest benefit of Cain is that it supports the use of Rainbow Tables for cracking hashes. This are similar to the permutations in Cain, but all you a lot more flexibility. X l Q Capitalize every pure alphanumeric word -c? There is plenty of about its command line options. This is the most powerful cracking mode, it can try all possible character combinations as passwords. When you just type in unshadow, it shows you the usage anyway. These are not problems with the tool itself, but inherent problems with pentesting and password cracking in general. . Further reading on this topic can be found using Google. Or to check from another terminal you can run john --status.